The title of the 16th Architecture Biennale, "freespace", and the somewhat nebulous manifesto by this year's curators, Yvonne Farrell and Shelley McNamara of Grafton Architects left a lot of free space for interpretation to the national and individual participations. 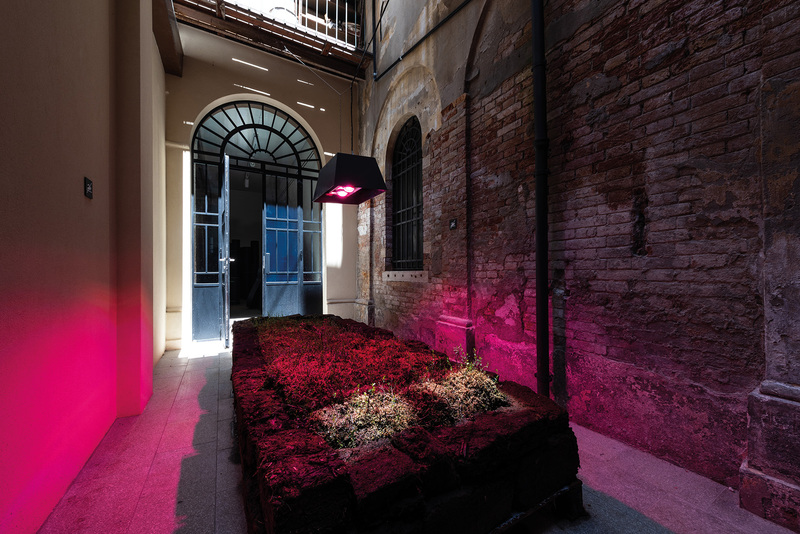 Inside the pay-to-entry Giardini Gardens and Arsenale exhibition spaces, the national pavilions, places often of loud manifestos and pompous architectural declarations, have this year provided limited opportunities for an encounter with the freespace. Even so, there have been also instances of projects and participants that seized the highly political connotations of this year's theme -however underscored by the inaugural manifesto's vagueness- and offered us a glimpse into what free space signifies, is, and could be for architecture and societies. There is no stronger contrasting image to the notion of free space than the one of borders, dividing territories and restricting access through definitions of nationality and citizenship. "Dimensions of Citizenship", this year's US participation, deals in a fresh and profound way with the topic, much relevant today not only in the USA (given the reality of the Border Wall) but globally. With their question "How might architecture respond to, shape, and express rhizomatic and paradoxical conditions of citizenship? ", they suggest that architecture can (and should) take a step further closer to interdisciplinary and more politically aware approaches of space when faced with the pressing issues of (spatial) inequalities. Legal, cultural and ecological understandings of citizenship are portrayed in a variety of media and scales in the U.S. pavilion, inviting us to look at the concept anew, as the only way to "activate potent spaces for design". In this context, the approach of the Belgian curatorial team, seems to say the least, out of tune. 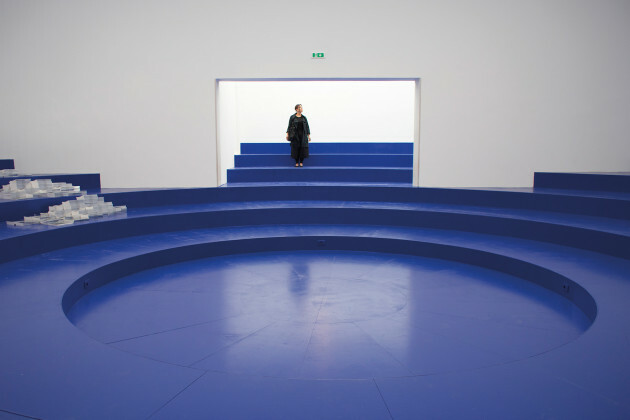 The highly Eurocentric approach of this year's exhibition, under the amusing title "Eurotopie", highlights the "deficiency of democratic and citizen spaces in the EU Quarter" and has created a deep blue "agora", space for dialogue and contemplation, inside the pavilion. While the call for a radical (?) democratisation of the European institutions and an expansion of the spaces of discourse between its citizens sounds primarily like a very good stance towards the European status quo, after a second look, it seems completely tone deaf to the harsh reality both inside Europe and -especially- around its borderline. When approaching the concept of freespace in a European level, one would wonder, if the other reality, the one of a Europe-Fortress, raising bloodshed border "walls" and building shameful refugee centers, doesn't really fit in well within the reinforcement of a confined notion of European citizenship. One would though argue that such hesitation to dig deeper into the diverse global realities and relations of power in play that define architecture always and today, is not surprising inside the protected elite meeting that the Venice Biennale itself is. Rising nationalisms that define the spatial realities of many, from Warsaw to Palestine, were nowhere to be found as defining parameters of how the mosaic of freespace is globally shaping today. There were, however, many projects that successfully articulated definitions of what freespace could signify, or rather the processes through which space can be lived and liberated. By asking a very primary architectural question, "What makes a public space free? ", the Hungarian team gave us a well-designed and to the point narration of the "liberation" story of one of the city's bridges. The Liberty Bridge of Budapest, symbol of freedom and rebellion, has been over the years occupied by citizens in the context of strikes, protests or, as in the most recent example in 2016, a claim of a new public space. 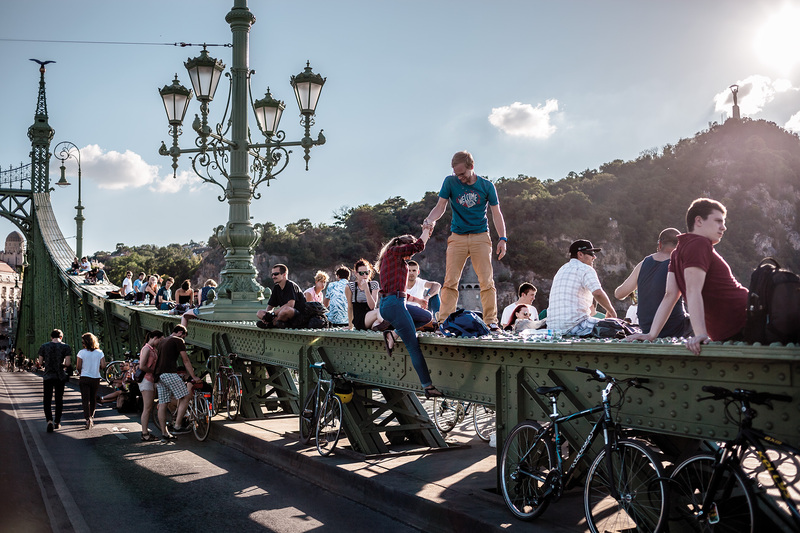 The bridge becomes spontaneously an open public space, filled by youth, cyclists and pedestrians, hosting picnics, yoga classes and live music, after being closed to traffic for renovation works. Apart from the beautifully designed exhibition, what catches one's eye is the central installation of a metal staircase, in the atrium of the pavilion, leading up to the roof. The sound of footsteps on the metal structure, as visitors go up and down, somehow resonate the feeling of climbing up to Liberty Bridge, or any other large piece of urban infrastructure, and fuels the fantasy of reclaiming, re-inhabiting and reinventing urban space. The feeling of this spontaneous, informal manner of inhabiting space, was the intention of British participation's Caruso St John and artist Marcus Taylor, who designed a similar metal structure, surrounding the British pavilion and climbing up to the roof, imagined as a kind of a new public space. The pavilion itself is empty, but not to remain unoccupied, as the curators have planned a "program of events including poetry, performance and film, as well as architectural debate". The two contrasting "free" spaces create some interesting metaphors (although mainly on Brexit) but the idea loses almost all momentum by being situated inside the restricted area of the Bienalle. 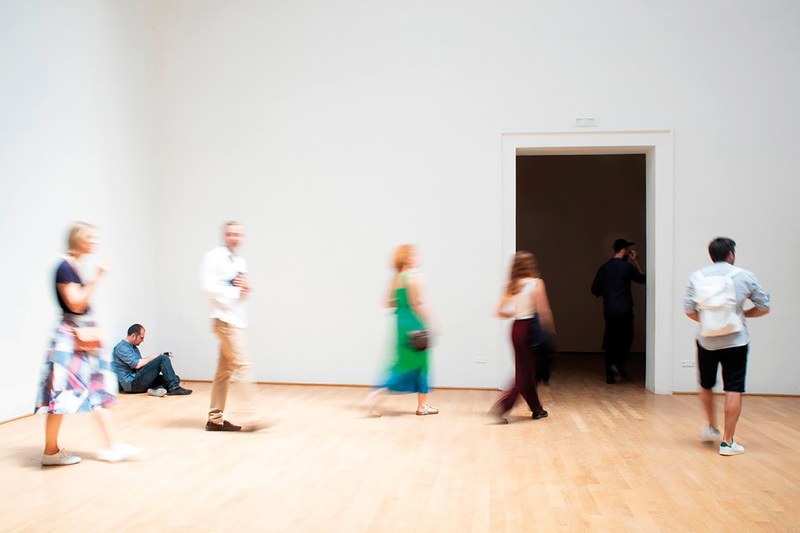 The Turkish team has intended, this year, amongst other things, a comment on this exact spatial nature of the biennale itself, through their project Vardiya (Shift). 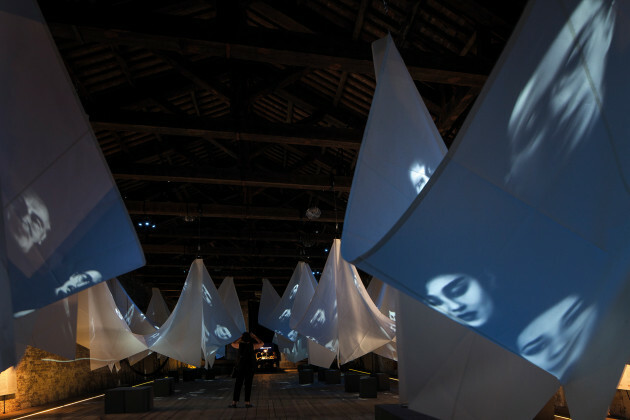 The innovative project "commits a program full of public events to turn Pavilion of Turkey into an open space for temporary accommodation, production and encountering", by inviting a whopping 122 international students to participate in a series of workshops, lectures and meetings and become active producers of the exhibition material. Similarly, in the first Lithuanian pavilion in the Venice Architecture Biennale, located just outside the Arsenale, we meet with the project The Swamp School, which in the words of its creators works as "a free space for unexpected encounters of architectural and artistic practice", hosting workshops, discussions and other practices of collaborative experimentation. The project proposes a critical stance towards the idea of nationally specific representations in the organization - "in the times of transnational crisis"- while suggesting another use of the exhibition space itself. Much like in the case of Vardiya, one will not find closed, finite suggestions of what architecture is or should be inside the pavilions, but rather encounter the processes of communal, collaborative work and meaningful dialogue. While both ponder over issues of accessibility and openness, probably their biggest contribution to the discourse on freespace is their theoretical as much as hands on approach towards art and architecture as open learning environments and spaces of unrestricted interaction and creation. Amongst all the diverse visions on how we architects should start to reflect upon this vast and exciting concept of freespace, I think this is one worth exploring. 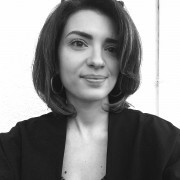 Mary Nassi, an Athens based architect, freshly graduated from the Architectural Engineering Faculty of the National Technical University of Athens. Her interest focuses on the intriguing verges of architecture, where the discipline intertwines with others: from gender studies, to visual arts and political theory. Currently she is working as an architect in Athens, working on projects of various scales and styles.